A part of the Those Twisted Pines Canon. "The Old Man of the Lake — which we refer to as SCP-3310 — is the linchpin in a complex thaumaturgical ritual system which prevents the catastrophic resurgence of a dormant apex-tier pluripotent entity with unknown ontokinetic, pistiphagic and deumorphic properties." Photographed Activity: Floating within Crater Lake, undisturbed. Photo Result: Scene has completely changed. A large hemlock tree now dominates the majority of the photograph, located on the shore of Wizard Island. Two unidentified humanoids are visible at the base of the tree, with one being depicted in the act of ripping out and consuming the heart of the other. Notes: It is unclear which mythological figure is represented by each figure. SCP-3310 floating in Crater Lake, Crater Lake National Park. Wizard Island visible in background. Special Containment Procedures: As a result of the inability to remove SCP-3310 from Crater Lake, containment must be focused on the prevention of activation events caused by the impediment of SCP-3310's movement. 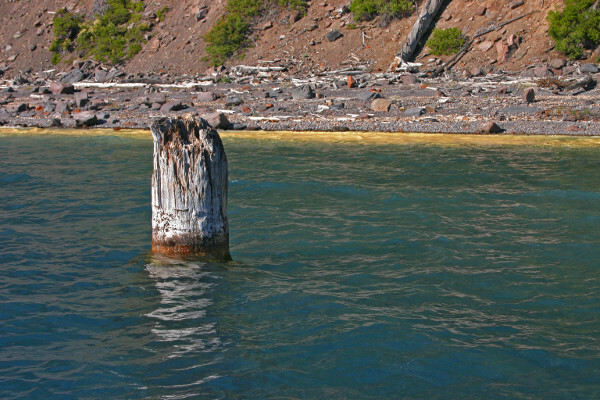 SCP-3310 is never to be removed from the lake, and if its movement ever becomes restricted, it is to be released or returned to Crater Lake immediately. Embedded Foundation agents in the United States Parks Department are to operate the functions of Crater Lake National Park. 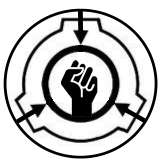 They are to discourage any physical interference with SCP-3310, and prevent or mitigate any activation events. Such personnel may be recruited directly from Parks Department employees already working at Crater Lake National Park. Submarine expeditions into Crater Lake are to be prevented by embedded personnel using their bureaucratic abilities. If personnel are unable to completely prevent a submarine expedition, they are to prevent such expeditions from tying SCP-3310, and instead encourage other methods of controlling SCP-3310's location. Should anomalous or unusual weather patterns occur around Crater Lake, the embedded personnel are to immediately confirm the status of SCP-3310 as free-floating and unrestricted in movement. If SCP-3310 is restricted in movement, embedded personnel are to free SCP-3310. In the event of an activation event, embedded personnel are to locate any resultant SCP-3310-Γ instances and prevent them from reaching Crater Lake by any means necessary, including termination. Description: SCP-3310 is a nine-meter tall tree stump floating in Crater Lake.1 SCP-3310 is anomalously able to float upright, with approximately 1.2 meters of the top remaining above the water at any given time. If removed from the water and returned, SCP-3310 will return to this position. SCP-3310 floats around Crater Lake as a result of nonanomalous weather patterns. The restriction of this movement causes two distinct and possibly linked anomalous phenomenon referred to as SCP-3310-Σ and SCP-3310-Γ. Previously, activation events were caused by the removal of SCP-3310 from Crater Lake, but recent activation events have occurred while SCP-3310 remained in Crater Lake (See Addendum-A). Both of these phenomena demanifest after the triggering cause for the manifestation is ended. Seven SCP-3310 activation events have been recorded by the Foundation and the American Secure Containment Initiative since 1894. SCP-3310-Σ is the manifestation of anomalous weather patterns around Crater Lake. The nature and intensity of these weather manipulation patterns have varied between different activation events (See Addendum-A), but generally appear to target or especially impede SCP-3310-Γ instances. The exact nature of SCP-3310-Γ instances has varied with each activation event of SCP-3310, but have generally been described as dark gray, translucent forms. SCP-3310-Γ instances have varied in form between activation events, but each activation event has only been associated with one type of SCP-3310-Γ instance. History: SCP-3310 was discovered by the American Secure Containment Initiative in 1894, during an attempt to confirm possible reports of a "phantom airship" in the surrounding area of Crater Lake.2 ASCI personnel noted SCP-3310 as being unusual, and inadvertently triggered the first activation event. Two years later, in 1896, SCP-3310 was discovered by civilian geologist Joseph Diller. He made note of the object, and mentioned it to several other members of the surveying team he was traveling with. In 1902, the results of his survey were released and included mention of SCP-3310. In response, the ASCI joined the lobbying efforts to establish Crater Lake and the surrounding area as a national park, as the increased security and protection of national park status would make containment of SCP-3310 easier. This action was successful, and Crater Lake National Park was formed. Currently, the existence of SCP-3310 is public knowledge. Due to an incident in 1988, knowledge that SCP-3310 was linked to an SCP-3310-Σ event is known, but believed to be superstition or coincidence. The Foundation has been able to introduce misinformation concerning SCP-3310 to explain its anomalous property of continuously floating upright, as well as attempt to discourage any serious scientific inquiry into the relation between SCP-3310 and SCP-3310-Σ. In the civilian community, SCP-3310 is known as "The Old Man of the Lake" and is a minor tourist attraction of Crater Lake National Park. SCP-3310 has been featured in several news and entertainment media and has a slight degree of fame. SCP-3310 was removed from Crater Lake by the ASCI under the belief that the only anomalous property possessed was the floating in an upright position. Fog immediately manifested upon Wizard Island, and then began to quickly spread out to cover the entirety of Crater Lake and the surrounding forest. After observing the immediate anomalous change in weather patterns surrounding Crater Lake, ASCI personnel requested permission to return SCP-3310 to the waters of Crater Lake. Permission was granted thirty minutes later, and SCP-3310 was placed back into Crater Lake. As soon as SCP-3310 assumed an upright floating position, the fog began to recede back to Wizard Island. SCP-3310 was removed from Crater Lake by the ASCI in order to redocument the anomalous properties, and form a containment strategy. Storm clouds manifested above Crater Lake and precipitated an anomalously high amount of water. After hour one, three meters of rainfall was recorded, resulting in large-scale flooding of the Crater Lake National Park. A large serpentine entity was spotted moving towards Crater Lake. It was unable to quickly proceed through the mud caused by the rainfall. After seeing SCP-3310-Γ-2 approach Crater Lake, ASCI personnel decided to abort the experiment and return SCP-3310 to Crater Lake. SCP-3310 was returned approximately 45 minutes after removal. SCP-3310 was removed from Crater Lake by the newly formed SCP Foundation to reconfirm anomalous properties. Wind speeds around Crater Lake began to exponentially increase, forming a vortex around Crater Lake. At the time SCP-3310 was returned to Crater Lake, wind speeds had reached 120 kilometers per hour and were projected to reach 300 kilometers per hour within the next thirty minutes. A large avian entity, with an estimated wingspan of 5 to 6 meters, was seen attempting to fly towards Crater Lake, but was unable to sustain flight in the extreme air speeds and repeatedly crashed to the ground. After one hour, Foundation personnel returned SCP-3310 into Crater Lake. Storm clouds manifested above Crater Lake, and an anomalously high number of lightning strikes began to strike the surrounding area. One hour after removal, an estimated 200 lightning strikes per minute was observed. A large number of canine entities were seen running in packs towards Crater Lake. The majority of these entities were directly struck by the lightning of the associated SCP-3310-Σ event. Civilian researchers assented to superstition and elected to untie SCP-3310, rather than continue with the submarine expedition as planned. Foundation security around SCP-3310 increased. SCP-3310 drifted into a natural outcropping and became stuck. Storm clouds manifested above Crater Lake, and hail began to precipitate. The hailstones were unusually large, ranging from 3 cm to 30 cm in diameter. Embedded Field Operative Lance Owens quickly ascertained SCP-3310 as the cause of the anomalous phenomenon, and was able to free SCP-3310 within 15 minutes of the activation event. SCP-3310 became entangled in a net that was present in Crater Lake. See Addendum-D for more information surrounding the circumstances of SCP-3310 shortly prior to this event. No weather patterns were immediately noticed by embedded personnel. Later geological analysis of Mount Mazama indicated that a brief period of volcanic activity had occurred around the time of the activation event. A large humanoid entity, estimated to be approximately 8 to 10 meters tall, was spotted walking towards Crater Lake. The entity was not noticeably harmed by small arms fire and continued moving towards Crater Lake. Embedded Field Operative Lance Owens quickly ascertained SCP-3310 as the cause of the anomalous phenomenon, and was able to cut SCP-3310 loose within 5 minutes of the activation event beginning. The following note and an artistic depiction of SCP-3310 were found inscribed upon a boulder on Wizard Island on November 30th, 1945. Some tombstones mark where the dead have been interred, while others serve to keep the dead interred. Llao's is of the latter. Report: Investigation by the Office of Tactical Theology has indicated that Llao is a god within the mythology recognized by the Klamath Native American tribe, indigenous to the region around Crater Lake. In this mythology, Llao is a god of the underworld and monsters, and is opposed by the god Skell, a god of the sky and animals. Llao has been described as deceased, with his remains located in Crater Lake. Skell and Llao were the mightiest of gods, warring against each other. Skell ruled over the sky, and had dominion over the spirits of animals. Llao ruled over the underworld, and had dominion over the spirits of monsters. One day, Llao and Skell fought each other. Llao, being the stronger and more aggressive of the two, overpowered Skell and killed him. He tore out the heart of Skell, and returned to Mount Mazama, where he ruled. Llao invited all the spirits to come to Mount Mazama, to celebrate his victory. Even the spirits of animals, who had served Skell, came. Llao hosted many games and celebrations in his triumph over his enemy. One of these games involved the spirits playing with the heart of Skell. During the game, the spirits of animals were able to steal the heart from the spirits of monsters. Taking the heart with them, the spirits of animals fled from the celebrations. The monsters attempted to catch the animals and take back heart. However, the animals were swifter and nimbler, and escaped with the heart. With the heart reclaimed, they were able to perform a ritual and return Skell to life. Skell, returned to life, challenged Llao again. This time, he did not lose and managed to kill Llao. He tore Llao into pieces, and cast them into Crater Lake, where the monsters would consume them, believing they of Skell. However, when Skell threw the head of Llao into the lake, the monsters recognized it. Llao's head became Wizard Island. After this, Skell threw the heart of Llao into the lake. The spirits of monsters, despairing over the loss of their master, scattered to the winds, never to be seen again. The spirits of animals began to walk the world in mortal form, and they rule the world to this day. Additionally, the Office of Tactical Theology has noted high levels of Akiva radiation in the area around Crater Lake, indicating that a god or similar entity may be in the area. Such readings spiked during the most recent activation event, indicating that a divine entity may have been present or active at the time. It is the official recommendation of the Office of Tactical Theology that further testing of SCP-3310 should immediately cease, and that all effort should be undertaken to prevent future events. Further, it is our recommendation that SCP-3310-Γ should be impeded by any means necessary from reaching Crater Lake. Finally, as active containment of SCP-3310 appears to be detrimental to consensus reality, we recommend a reclassification of SCP-3310 from Safe to Archon. I'm not sure if this is the right format to say something like this, but I'm not sure how else I should do it. This is what I was told to use whenever the Old Man got stuck, but nobody ever told me what I should do if I needed to file something else instead. I've only really ever been briefed on what to do concerning 3310, and that's my only interaction with the Foundation. I'm sorry if this is wrong. There hasn't been an activation event of SCP-3310, but there's been some strange things happening around Crater Lake that I didn't think were right. It's a bunch of small things, little tidbits and pieces of information that you aren't really sure mean anything on their own, you know? It's just built up to the point where I felt I had to say something. I guess I should start. The first things first: the weather around Crater Lake has been getting freaky lately, even when the Old Man is perfectly fine floating in the lake. There hasn't been anything as big or as huge as a Sigma event, but it's just little things and I don't know if they mean anything by themselves. The temperatures been odd lately. One day last week, the temperature spiked to 90 degrees, which is significantly above the average temperatures up here. It stayed there for about an hour, and then dropped back down to the normal temps in the 60s we get. That's not the first time it's happened, mind you: we've been getting that a couple times every summer for a decade, and the reverse in the winter. There's been some strange weather too. Three weeks ago it snowed a foot, in July. Snow in July isn't weird out here, but that's more than we're used to. I went out to spot the Old Man, and I find him in the middle of Crater, bobbing along, just fine. The snow kept falling, and it seemed like a normal, light snowfall except for the time of year. I watched the Old Man the entire time, and he was fine the entire time. There's also been some strange sightings that I think might be related to the Gammas. Again, I want to say that the Old Man has been safely within Crater Lake whenever these sightings took place, and we've confirmed the whole thing as not being because movement got fucked up. Ever since that event in '96, wolves howl on some of the full moons. It's loud, and you can hear the howls for miles. There's only one problem: there aren't any wolves in Crater Lake, or anywhere around here. On one of the first nights, I went out to check out the problem. I got down to the lake and saw dozens of massive wolves, the size of cars, howling in unison. They didn't react to me being there at all, just standing there, howling at the water's edge. They were all grey and vague, like how Ash has described the Gammas to me as. I went back to get a gun, and by the time I got back they were gone. At the start of this summer, we had some campers, and me and Ash stayed on camp to make sure nothing bad happened. That night, we heard this low hum, coming from somewhere. The campers said it was a UFO, but we knew better. The hum kept getting louder, but we couldn't leave to check it out, since we had to keep an eye on the campers. The hum kept getting louder and louder, and then, a dark shape flew over the camp, headed off into the distance. I chased after it while Ash stayed behind to keep watch on the campers. I was able to follow it for a couple minutes before the trails couldn't be passed anymore, at which point I decided to go check on the Old Man. I got to the lake and went out on the boat, looking for the Old Man. He was drifting alone peacefully on the lake. The whole scene was nice and peaceful, until the shape flew over us and then crashed into the water. It was the strangest thing - it didn't break the surface, just bounced right off like it was concrete. There was no spray of water, no explosion. The thing just picked itself up and left. I don't want to seem like I'm jumping to conclusions here. I've held off on reporting any of this because none of it seemed linked to the Old Man to me. But lately I've been thinking - we don't really know how this works, do we? I don't know if some eggheads in a lab have pieced this whole thing together, but you haven't told me if you did. What if Llao is breaking through, or is growing stronger, or something? The stuff I've seen recently, it just seems like the Old Man is failing to do its job. I mean, ten years ago there was that whole incident where it activated while it was still in Crater Lake. I've got notes here about the ASCII tying the thing up and not getting a response, which means that something had to have changed recently. And with the whole ghosts and minor weather disturbances, it just feels like stuff is slipping through. 1. Crater Lake sits within the caldera of Mount Mazama, an active volcano. Mount Mazama is located in Crater Lake National Park, Oregon, USA. 2. These reports were never proven, and are believed to be spurious. There were strange figures in that mist. When any of us attempted to approach them, they would shy away from us, further into the fog. There was something quite queer about them, however. Some of them seemed to possess too many limbs at a time, and those limbs were far too long. When we let them be, they seemed to be all heading in a singular direction, which I realized was the lake after the fog cleared. 4. Foundation security around SCP-3310 had become lax after an assessed low threat level. No embedded agents were present at Crater Lake on this date, but the plan to secure SCP-3310 was approved by higher level embedded agents, not believing anomalous effects would activate. 5. Records of this event are lack precision, due to Foundation personnel not being physically present. 6. Embedded Field Operative Ashley Peterson was able to terminate one instance with small arms fire. The other instances did not react to the death of said instance, and continued towards Crater Lake.